D. M. Muthubanda and his wife are among the first batch of residents in Laggala Pallegama village who left their original settlements that they and their ancestors had been living in for centuries. One of the displaced, clearing the land to build a house in the new settlement. 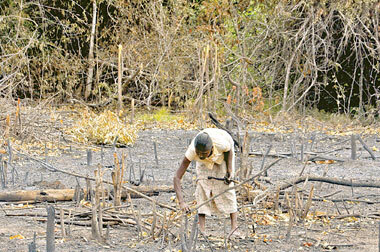 They are leaving their villages paving the way for the construction of the Kaluganga and Moragahakanda reservoirs. When the two projects are completed, their villages in the reservoir bed area will no longer exist. They sacrificed their traditional homelands for the sake of the development of the country where thousands of people will benefit. We met them in the new residential area they have been provided with, about 15 kilometres away from their original village. They were working on parched land, a forest that had been cut and burned for cultivation during the coming Maha season and to construct a house. The new settlement is not a traditional village but a new colony with all infrastructure facilities. "We would have preferred to stay in our traditional village where for generations our ancestors had been living but now there is no option. We got two acres of land, 1.5 acres of paddy land and half an acre in the residential area to construct a house," Muthubanda said. "We received reasonable compensation and the Mahaweli Authority provides much assistance to shift to the new settlement and start a new life," he said. These people including Muthubanda who were displaced due to the construction of large dams are known as dam-affected people and their grievances are a globally discussed development issue. According to the World Commission on Dams, over 40 million people all over the world have been forced to leave their traditional homelands due to the construction large dams during the past six decades. Around 3,000 families have been displaced due to the Moragahakanda and Kalu Ganga development projects and officials said that most of the people do not refuse to leave the area. There are several reasons; "First we offer an attractive compensation package so that the families can start better lives in residential areas with all facilities. The compensation package was based on market value of the property including trees in their gardens," said the Project Director of the Kalu Ganga project, R.B. Thennakoon. "Even after receiving compensation they can cut the trees for timber in their new houses. The new settlement is about 10-15 kilometres away from their former villages," he said. "In this resettlement program we considered the social issues that arose in similar projects in the past. The allocation of land in the new settlements was done to conform to the same environment that prevailed in their traditional villages, by discussion with the community," said Thennakoon. Therefore, in the new village too they have their neighbours and relatives in close proximity, said the sociologist of the project, Mahinda Ranasinghe. Some people are happy with the compensation packages they received but some others said they did not receive a reasonable amount. Recently they carried out a protest in front of the project office demanding a better compensation package. The dam site of the Moragahakanda project. Ranasinghe said that the compensation package was based on the value of the property and those who were in unauthorised government land received lower amounts. Some people resist change due to practical difficulties they face but they get much assistance from the government, especially the poor people. The lives of the most of the people will be better in the new settlements, specially those who did not have a permanent income and lived by working as casual labourers. They get fertile land for cultivation, water for two seasons with other facilities, he said. The environmental cost of the two projects is massive and varied. The two reservoirs cover a vast land area, human settlements and huge forest cover bordering the Wasgamuwa national park. The environmental cost of the project is visible and electrified fences have been set up at several places, including staff quarters, offices of the project to prevent wild elephant invasion. The project has extensive plans to minimise the environmental impact and it includes reforestation of 1,365 hectares of catchment areas around river boundries, declaration of elephant corridors to Girithale, Mineriya and Wasgamuwa national parks, and the setting up of electrified fences, said environmentalist Upali Nandasena. However, there are many environmental issues that cannot be corrected in a large project such as this. Whatever the socio- environmental costs, government's should take bold decisions to meet the increasing demand for food, water and electricity and provide land for cultivation and human settlements. The only option is to minimise environmental problems and officials of the Mahaweli Authority said that with their decades of experience they will be successful in achieving the goals. The two reservoirs will be among the last projects in the Mahaweli Master Program prepared during the 1966-68 period with the assistance of UNDP and Food and Agriculture Organisation (FAO). Construction work on the Moragahakanda dam will be completed in 2016 and work on the Kalu Ganga dam will start soon. The project includes another component that plans to bring water from Randenigala reservoir and extend the water supply up to Iranamadu in the Northern province through the North Central Province canal. However, the feasibility study of the project has not yet been completed. Deputy Project Director (Engineering), D.B. Wijerathne said that the two projects will bring tremendous benefits to people in the North Central, Eastern and Central provinces. It will provide water to 82,000 hectares for cultivation during the Yala and Maha seasons, drinking water facilities, 20 MW hydro power generation and various other economic activities such as fresh water fisheries. The water of the Kalu Ganga reservoir will carried to the Moragahakanda reservoir through a 3.5 km tunnel and 9.6 km canal. The Moragahakanda dam consists of three parts, the main dam across Ambanganga and two saddle dams. 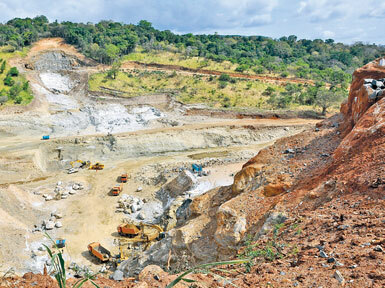 The first saddle dam, a earth-filled dam has already been constructed by the Mahaweli Authority with government funds. The area which will go under water. The second saddle dam is now being constructed by the Sinohydro Corporation of China. It is a Roller Compacted Concrete (RCC) dam and engineers said that this is the first project where RCC technology was used. The main dam is a rock-fill dam, they said. Officials said that Chinese construction companies are experts in RCC technology. The contractor has brought Chinese engineering experts, skilled labourers and hired Iranian geologists. This is common scenario in present day mega construction projects that are financed by Chinese or Indian credit lines and implemented by their own contractors. Therefore, the most important component of foreign investments, the transfer of technology, is poor. The chief engineer Lee, a Chinese who speaks and understands Sinhala, has been working in Sri Lanka for over five years. He has previously worked in road development projects in Ampara and Hambantota. Junior Sri Lankan engineers and unskilled labourers also work under the Chinese contractor but they are not happy with the wages they receive. Officials of Mahaweli Authority complain that the media is eager to report minor incidents such as the death of a Chinese worker who ate an unknown yam variety or an accident, but not the massive development work they are doing under difficult conditions. "In projects such as this, apart from the engineering aspect we have to consider all socio economic and environmental aspects of development. We are handling several activities such as constructing roads, maintaining nurseries to cater to forestation projects, farmers needs, maintaining model farms to educate farmers", said engineer Vijay Basnayake.